New York is a wonderful place to dine out – if you’re looking for reservations for a particular restaurant or cuisine, ask the advice of the hotel concierge, who may even be able to secure you a reservation. Otherwise, The New Yorker is in the centre of Midtown New York – so just head out and see what restaurant you discover. The New Yorker has two restaurants within the hotel; Cooper’s Taver and the Tick Tock diner. Both are well worth a visit, with Cooper’s Tavern offering regional American dishes in a semi-formal dining atmosphere, and the Tick Tock diner showcasing the best of the American diner culture. Fancy a breakfast with your eggs over easy at 6am? 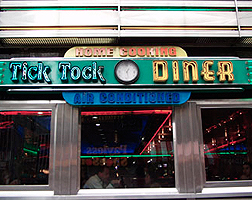 Tick Tock diner’s the place to go – it’s open 24-hours – whilst Cooper’s Tavern serves lunch and dinner daily – although it is wise to make a reservation.